(Bloomberg) -- Australia’s worst property market slump in a generation has the central bank and government worried. But even amid fears that tumbling prices may derail the economy, the nation’s mortgage bonds still look attractive to some of the biggest buyers. Realm Investment House, a top-performing credit fund based in Melbourne, says an uptick in arrears is no reason to panic. The reason? Strong employment and low interest rates are keeping borrowers above water. Vivek Prabhu, head of fixed income at Perpetual Ltd., has even been adding holdings of senior AAA rated residential mortgage-backed securities as a “defensive” play amid rising volatility as global central banks withdraw liquidity from the financial system. The prime spread for the Australian dollar senior tranche for the two securities priced so far this year averaged 139 basis points, according to Bloomberg data. That compares with an average prime spread for 2018 of 112 basis points. The Reserve Bank of Australia, which has kept rates at a record low 1.5 percent since August 2016, has shifted to a neutral policy stance as the property downturn weighs on household spending and dampens growth. Treasurer Josh Frydenberg said at the weekend the slump could flow into the broader economy, hitting small businesses that have taken out loans on the value of their family home. There are some signs of the downturn showing up in the RMBS market. Suncorp Group Ltd. earlier this month said arrears on one parcel of securities originally sold in 2010 are creeping past the level that triggers a change in how principal repayments are carved up. 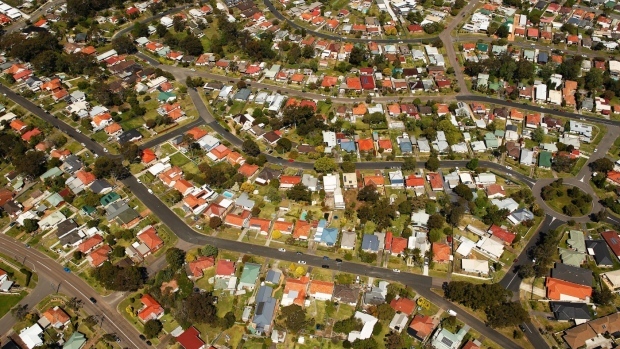 Arrears for more than 90 days on mortgages underlying Australian RMBS increased to a record in December and are likely to remain elevated over the next 12 months, Standard & Poor’s Global Ratings said in a March 14 report. But that record is still only 0.75 percent. “Stable employment conditions and low interest rates will enable most borrowers to meet their debt servicing commitments,” S&P said. That’s a sentiment shared by Andrew Papageorgiou, investment manager at Melbourne-based Realm. “There is nothing there from a systemic standpoint which makes us feel like we need to alter our exposure to bank system risk,” he said. Employment and funding costs are a crucial factor in arrears and default rates, and Australia is doing alright in those areas. Interest rates are at record lows, as is the percentage of household income used to meet mortgage payments, according to Papageorgiou. At least three new residential mortgage-backed securities worth A$1.45 billion ($1 billion) are expected to price this month, adding to total issuance of A$4.15 billion this quarter. That compareas with A$5.26 billion from the same three-month period in 2018, according to Bloomberg data. Papageorgiou’s Realm High Income Fund has outperformed 87 percent of peers over the past three years. He expects non-bank lenders will be solid issuers this year. For Sydney-based Prabhu at Perpetual, history is another reassuring factor. --With assistance from Cherrie Marie Soriano.